Whenever I am visiting my family in New York I always have to have 2 things, pizza and bagels. I tried lemon chicken pizza the last time I was home and have been dreaming about it ever since. I decided to try to make my own recipe. It's not as good as the NY version, but it is really yummy and satisfied my craving for it. I always love spinach and mushroom pizza, so I made that too just in case the chicken picatta pizza came out tasting gross. Luckily both pizzas came out really yummy, so we had lots of leftovers for lunch the next day :) You can serve these pizzas to your whole family starting at 12+ months. Preheat oven to 450F. Take dough out of package and place on a lightly floured surface. Let rest for 20 minutes. 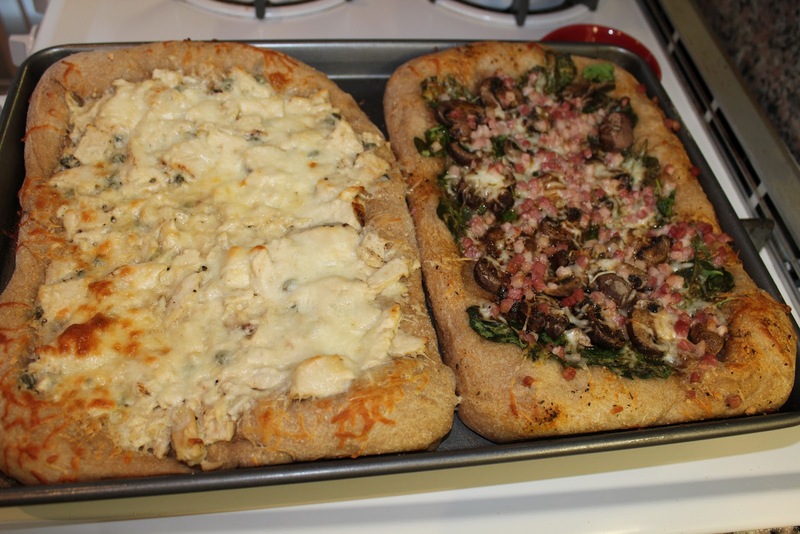 Using your hands or a rolling pin, roll out the dough and place on a pizza stone or a cookie sheet. Brush the dough with olive oil and set aside. Now we're going to make the sauce. Put 1 tbsp olive oil in a medium skillet over medium high heat. Add the garlic and saute until fragrant (30 seconds). Add the rest of the olive oil and the flour. Mix until a paste is formed. Add the chicken broth a little at a time while continuously stirring. Add lemon juice and capers and stir for another minute or two. Add chopped chicken and toss to coat. 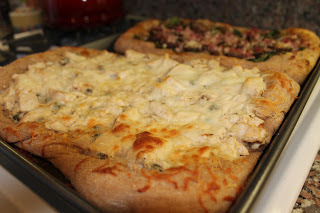 Pour chicken and sauce over pizza dough. Spread out chicken to cover all the dough. Cover with mozzarella cheese and place in the oven to bake. Back for 10 to 15 minutes. Let cool and then cut into slices. Make sure to cut your little one's piece up into tiny pieces. Serve and enjoy! Preheat oven to 450F. Take dough out of package and place on a lightly floured surface. Let rest for 20 minutes. 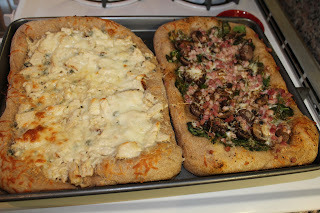 Using your hands or a rolling pin, roll out the dough and place on a pizza stone or a cookie sheet. 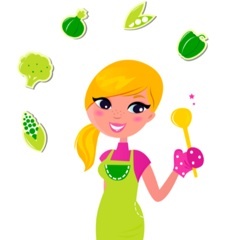 Brush the dough with olive oil and season the dough with garlic powder and Italian seasoning. 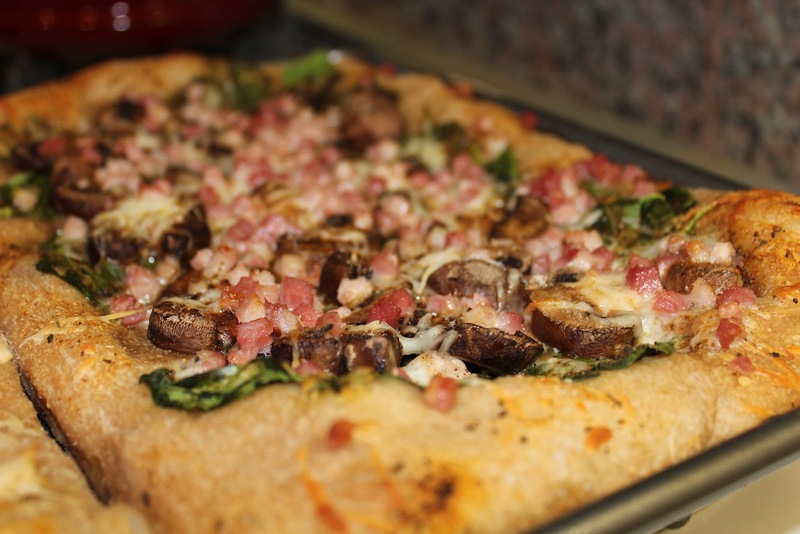 Place baby spinach, mushrooms and pancetta around the dough. Sprinkle with cheese and drizzle with a little olive oil. Place in oven and bake for 10 to 15 minutes. Let cool and then cut into slices. Remember to cut your little one's portion up into bite size pieces. Serve and enjoy!